Apple Store employees weren't fazed at all! It might have been the most unusual customer to ever appear at Apple’s Palo Alto store, but not entirely out of place in the heart of Silicon Valley. On Friday morning, among the hundreds who queued for the iPhone 6S to go on sale, it was not human, not animal, but machine. 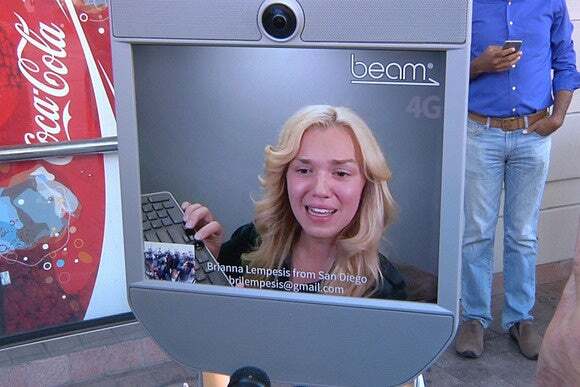 Brianna Lempesis in San Diego was inside the machine, a Beam telepresence robot that’s capable of trundling around on wheels and videoconferencing with anyone it meets. A telepresence robot trundles into Apple’s Palo Alto store in the hopes of buying an iPhone 6S on launch day, Sept. 25, 2015. Lempesis works for Suitable Technologies, the company that sells the robot, and her presence in line at Palo Alto was more to generate publicity for the product than anything else. But it worked. Not only did Lempesis manage to get interviewed by numerous local TV crews but Apple also entertained this unusual way of buying an iPhone. Once inside the store, she was able to communicate with an Apple employee and go through the entire purchase procedure. It turned out some money had been stashed inside a rear panel of the robot and an Apple employee retrieved it upon instruction. 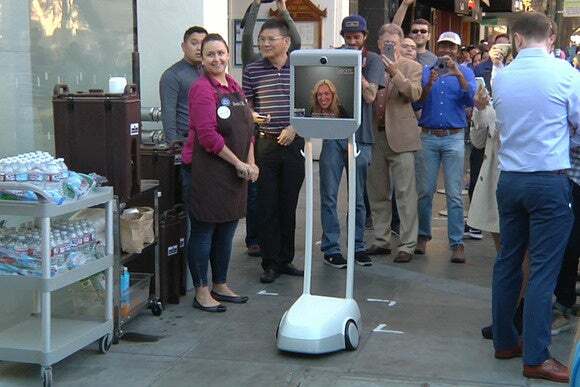 In addition to the iPhone itself, the robot was clearly the star of the launch and was pursued by cameras as it navigated the store and came back outside. 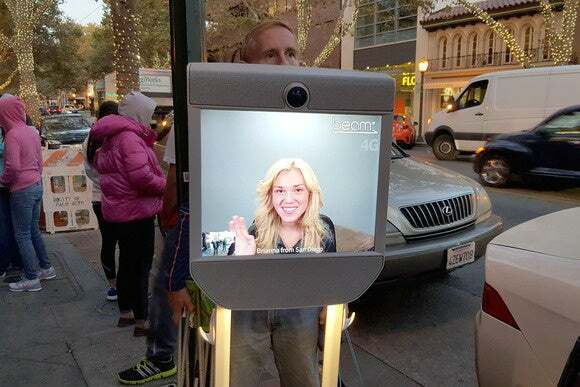 Brianna Lempesis is seen through a telepresence robot outside Apple’s Palo Alto store on Sept. 25, 2015. Lempesis told reporters that she had been waiting since Thursday at 10 a.m. to make the purchase. After the purchase, the iPhone was put into a bag and placed onto a hook on the side of the robot, making it easy pickings for a thief—but Lempesis said she isn’t worried. “I don’t think anyone will [steal it],” she said. “I really think people are better than that and so far that’s what I’ve experienced. The robot isn’t a stranger to Palo Alto. 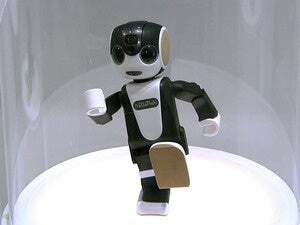 The company has a store on University Avenue, a short walk from the Apple Store, and robots can often be seen on the street trying to engage passersby in chit-chat.